WASHINGTON, D.C., October 9, 2012 – Peace Corps Response volunteer Meisha Robinson of Philadelphia, Pa., and12 Peace Corps/South Africa volunteers collaborated with Special Olympics staff and community members to organize the inaugural Special Olympics Africa Unity Cup with 15 soccer teams from Oct. 3 through Oct. 6 in Phokeng, South Africa. 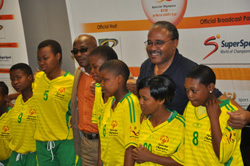 Teams from Botswana, Cote d’Ivoire, Kenya, Mauritius, Namibia, Nigeria, Senegal, South Africa, Tanzania, Uganda and Zambia participated in the tournament. Soccer teams with disabled youth from 11 African countries competed in the tournament, with the first round of men’s and women’s games Oct. 4, the semifinal round Oct. 5 and finals Oct. 6. The countries awarded first, second and third place will compete in the Special Olympics Unified Cup next year in Rio de Janeiro, Brazil. 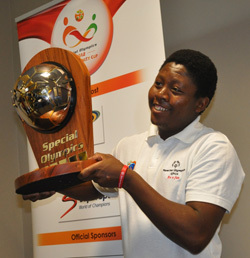 The winners include men’s teams from South Africa, Tanzania and Cote d’Ivoire, and the women’s teams from Cote d’Ivoire, Namibia and South Africa. Peace Corps volunteers also taught participants about healthy lifestyles, held a youth and family forum, and a health screening for athletes. 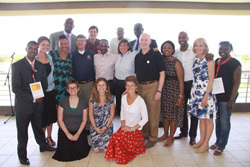 Special guests included the Royal Family of The Bafokeng Nation; U.S. Ambassador to South Africa Donald Gips; Special Olympics Chairman and CEO Timothy Shriver; Peace Corps/South Africa Country Director John Jacoby; and celebrity athletes and entertainers. This marks the first time Peace Corps volunteers in South Africa have partnered with the Special Olympics since a Memorandum of Understanding was signed by former Peace Corps Director Aaron S. Williams and Special Olympics Chairman Shriver in 2011. About the Special Olympics: Special Olympics is an international organization that changes lives through the power of sport by encouraging and empowering people with intellectual disabilities, promoting acceptance for all, and fostering communities of understanding and respect worldwide. Founded in 1968 by Eunice Kennedy Shriver, the Special Olympics movement has grown from a few hundred athletes to more than 3.7 million athletes in over 170 countries in all regions of the world, providing year-round sports training, athletic competition and other related programs. Special Olympics now takes place every day, changing the lives of people with intellectual disabilities all over the world and in the community playgrounds and ball fields in every small neighborhood’s backyard. Special Olympics provides people with intellectual disabilities continuing opportunities to realize their potential, develop physical fitness, demonstrate courage, and experience joy and friendship. Visit Special Olympics at www.specialolympics.org. About Peace Corps/South Africa: More than 1,080 Peace Corps volunteers have served in South Africa since the program was established in 1997. Currently, 165 volunteers serve in South Africa. Volunteers work in the areas of education and health. Volunteers are trained and work in the following languages: isiNdebele, isiZulu, Sepedi, Setswana, siSwati, Northern Sotho, Venda, XiTsongo, Xhosa and Afrikaans. About the Peace Corps: Since President John F. Kennedy established the Peace Corps by executive order on March 1, 1961, more than 200,000 Americans have served in 139 host countries. Today, 9,095 volunteers are working with local communities in 75 host countries. Peace Corps volunteers must be U.S. citizens and at least 18 years of age. Peace Corps service is a 27-month commitment and the agency’s mission is to promote world peace and friendship and a better understanding between Americans and people of other countries. Visit www.peacecorps.gov for more information.